Ahh, The Batman. Never has a series been so revered and hated in recent memory as this one; fans slammed it for not being B:TAS and those that stuck by the show were given a rollercoaster of a ride, with seasons varying wildly in terms of content. The first season was a relatively light affair, with the second dropping a bit darker and the third lightening up, while the final two seasons again took the bumpy road with content. After a satisfactory fourth season, the series returned to airwaves for a final season that focused on making the series more of a team effort, where we saw the introduction of a myriad of superheroes that have only seen the animation world a few times before. For his fifth and final season, The Batman picked up where the fourth ended, introducing new superheroes into the Gotham City landscape, as well as forming their own Justice League. From the start the season starts off with a Batman/Superman two-part episode that pits The Dark Knight against a kryptonite controlled Superman under the power of Lex Luthor. Soon after that The Flash, Green Lantern and Hawkman all show up to lend a hand to the Dark Knight as their own breed of criminal, including Mirror Master, Sinestro and Shadow Thief, come to Batman’s city to wreak havoc. By the end of the season the entire Justice League, aside from Batman and his team as well as Green Lantern, are turned into robotic slaves courtesy of The Joining, the aliens who invaded Earth at the end of the fourth season. It may come as a surprise to many that I didn’t watch the fifth season of The Batman until it had finished. I decided that with my busy schedule that I would just wait it out and watch the series in a few days time to fully appreciate it for what it’s worth. What I witness, however, was a horribly uneven season that relied more on guest stars than actual plot points to carry it along. There was no flow to the season, no real sense of what the season was really about. It just pushed out cameo after cameo among other Penguin and Joker episodes before it finally ended. By the end of the season I was actually really just astonished at how weak it was. Now I haven’t been the biggest fan of the series, it’s been wildly uneven and just when I feel that it’s going to hits its groove, I’m met with another season that is completely screwed up. I don’t blame the writers so much as the network’s constant notes on how that it needs to be darker/lighter, depending on how they’re feeling for each season. It’s such a strange mixture that it is incredibly difficult to get into the series as you never know what to expect. It’s Batman, sure, but is it going to be Batman Begins this season or Superfriends? I can’t pick out a single episode from this season that I was actually impressed with; I had heard so much good about it prior to watching it that I at least expected to be entertained, but I was so unimpressed by it all that the adult in me (what little there is) began to become disgusted by the plots and dialogue of some of the episodes. I can stand a little talking-down-to in my cartoons, but what came out of these episodes was just so mindless and basic that I was neither impressed or offended by it. It was such a mediocre effort that I became immediately turned off by the majority of the episodes presented here. The humor in this show has never been truly award winning and while I haven’t laughed a lot throughout the seasons, I can’t remember even chuckling a bit at this season. I think I was more let down by the lack of global appeal of this season more than anything; this one really was for kids and for only the most die-hard of fans. Of course I’ll admit seeing Superman, Green Lantern, Hawkman and Flash show up on this show was interesting and each one of their episodes provided a bit of enjoyment. In particular I found Lantern’s to be the most interesting of the bunch, simply because we got to see Batman handle the power ring for a bit. The series final two episodes weren’t too impressive either, although seeing Robin and Batgirl interact with the other League members was neat. The season was pocked-marked with these type of cool moments, but the overwhelming majority of the season was simply a waste to me. Despite all of this the mere fact that it’s Batman and has other DC superheroes in it makes it worth seeing all in of itself. I really just wanted more from the series but I wasn’t given nearly enough for this season to completely work for me. While I was completely disappointed with it, it had its moments and the season is at least worth checking out for the Harley Quinn and Green Lantern moments which always seem to entertaining. Recommended for the fans, Rental for the curious. 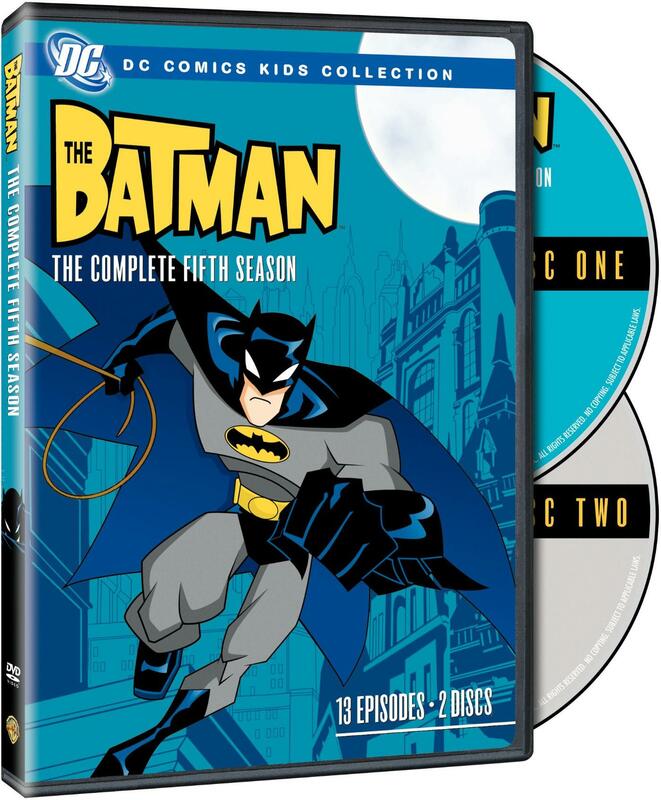 The final season of The Batman arrives on DVD in the standard casing as the past seasons. An advertisement for the LEGO Batman game is included inside the casing, with disc art that is nearly indistinguishable from previous seasons. I can’t decide if I like how they all match, but are in different colors, or if it’s just lazy. Menus are simple and easy to navigate, although the overwhelming use of long-since-expired stock art (season 1 Joker…really?) and the complete lack of even any Robin, Batgirl or Justice League art is highly strange. Video and audio for this release is clean and clear. A crisp progressive video transfer is included that is vivid and as clean of a transfer as we’re ever going to see for this series. The 4×3 ratio is the only thing to complain about here (it’s a shame we couldn’t have gotten 16×9 on this season…some of the framing just screams 16×9) and the accompanying English Dolby Stereo tracks are clean and clear. An optional French Surround Stereo is also available, as are English and French subtitles. 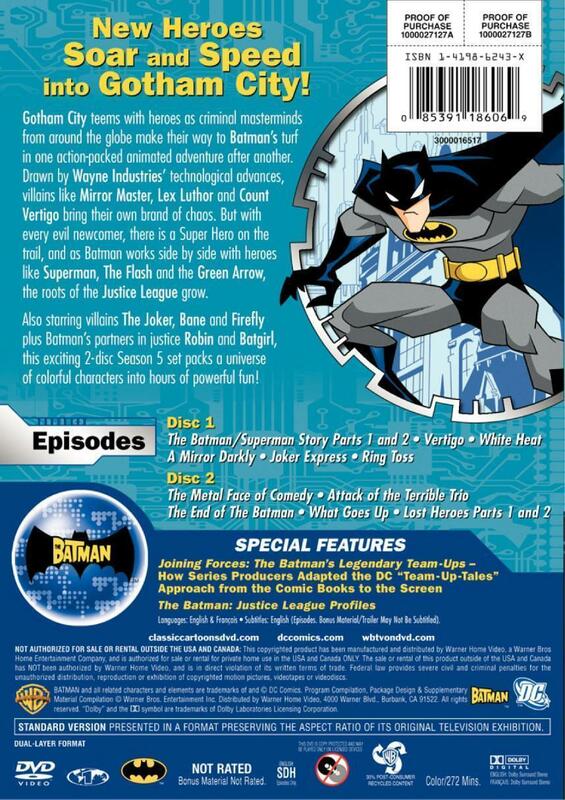 Extras on this release are split into two featurettes: “Joining Forces: Batman’s Legendary Team Ups” (8:40) talks about the “Team-Up-Tales” and how the producers decided which elements of the original comic book stories to include in the individual episodes. The other extra, “The Batman: Justice League Profiles” (11:39) takes a look at the individual League members, again with commentary from the producers of the show. They’re a nice little group of extras and while I would’ve liked an episode commentary, I know that’s asking for too much on these DC Comics Kids Collection releases. Overall it’s a solid set with a mediocre batch of episodes, but still worth checking out if you’re a fan or are interested in the Bat. As with the season itself, this set is Recommended for the fans and a Rental for the curious.